Asa "Al Jolson" Yoelson (May 26, 1886 – October 23, 1950) was an acclaimed American singer and actor whose career lasted from 1911 until his death in 1950. He was one of the most popular entertainers of the twentieth century whose influence extended to other popular performers, including Bing Crosby and Eddie Fisher. Jolson is best known today for his appearance in one of the first "talkies," The Jazz Singer, the first feature film with sound to enjoy wide commercial success, in 1927. Performing the song "Mammy" in blackface, Jolson ad-libbed his signature catchphrase, "You ain't heard nothing yet!" Along with being one of the supreme performers of the vaudeville stage, Jolson was also the first musical artist to sell over 10 million records. Although Jolson's legacy has been somewhat controversial due to his use of stage blackface, his work is being re-appreciated for capturing the roots of minstrelry shows and the classic popular songs of his era. Jolson was born in Seredzius, Lithuania, as Asa Yoelson. In his early childhood, he immigrated to the United States with his parents, Moshe Reuben Yoelson and Naomi Ettas Cantor. His father became the rabbi of the Talmud Torah Synagogue (now Ohev Sholom Talmud Torah), in Washington, D.C.
Jolson became a popular singer in New York City, beginning as early as 1898, when he and his brother entertained troops during the Spanish-American War. He gradually developed the key elements of his performance: blackface makeup; exuberant gestures; operatic-style singing; whistling; and directly addressing his audience. By 1911 he had parlayed a supporting appearance in the Broadway musical, La Belle Paree, into a starring role. He began recording and was soon internationally famous for his extraordinary stage presence and personal rapport with audiences. His Broadway career is unmatched for its length and popularity, spanning close to 30 years (1911–1940). Audiences shouted, pleaded, and often would not allow the show to proceed without his encore, such was the power of Jolson's presence. At one performance in Boston, the usually staid and conservative audience stopped the show with applause for 45 minutes. He was said to have had an "electric" personality, along with the ability to make each member of the audience believe that he was singing only to him or her. However, he is best known today for his appearance in one of the first "talkies"—The Jazz Singer—the first feature film with sound to enjoy wide commercial success, in 1927. The film is the story of a young Jewish man, Jakie Rabinowitz, who defies the traditions of his devout Jewish family when he seeks to become a popular singer of secular music. In The Jazz Singer Jolson performed the song "Mammy" in blackface. In fact, Jolson's singing should not be considered as jazz, for his style remained forever rooted in the style of the vaudeville stage at the turn of twentieth century. Jolson ad-libbed his best-known catchphrase, "You ain't heard nothing yet!," in The Jazz Singer. It is also the name of a song he co-wrote earlier. Signing with the Warner Brothers studios for a series of "talkies," Jolson made The Singing Fool (1928)—the story of a driven entertainer who insisted upon going on with the show even as his small son lay dying—and its signature tune, "Sonny Boy," became the first American record to sell three million copies. He went on to make "Say It with Songs" (1929), "Mammy" (1930), and "Big Boy" (1930) before returning to the Broadway stage in 1931. His fame faded a bit by the late 1930 and early 1940s, but with the 1946 release of the box-office-hit, and biographical film, "The Jolson Story"—with actor Larry Parks lip-synching Jolson tunes—the singer was once again in demand. The soundtrack went on to sell several million copies, and a new generation began to experience the inimitable Jolson style. Among the many songs he popularized were "You Made Me Love You (I Didn't Want to Do It)," "Rock-A-Bye Your Baby With A Dixie Melody," "Swanee" (songwriter George Gershwin's first success), "April Showers," "Toot, Toot, Tootsie, Goodbye," "California, Here I Come," "When the Red, Red Robin Comes Bob-Bob-Bobbin' Along," "Sonny Boy," and "Avalon." Jolson was the first musical artist to sell over ten million records in total. While no official Billboard magazine chart existed during his career, its staff archivist Joel Whitburn used a variety of sources to estimate the hits of 1890-1954. By his reckoning, Jolson had the equivalent of 23 Number-One hits, the fourth-highest total ever, trailing only Bing Crosby, Paul Whiteman, and Guy Lombardo. Whitburn calculated that Jolson would have topped one chart or another for 114 weeks. Unlike most other Jews in the arts, Jolson was a political and economic conservative, supporting Calvin Coolidge for President of the United States in 1924 (with the ditty "Keep Cool with Coolidge"). Jolson was married to actress/dancer Ruby Keeler from 1928 to 1939, when they divorced. The couple had adopted a son, Al Jolson Jr., during their marriage. However, when he was 14, the boy changed his name to Peter Lowe after his mother's second husband, John Lowe. After leaving the Broadway stage, Jolson starred on radio. The Al Jolson Show aired 1933-1939, 1942-1943, and 1947-1949. These programs were typically rated in the top ten. In 1950, Jolson signed with CBS Television, but died in October of that year before any broadcasts could be initiated. After the success of Warner Bros. film Yankee Doodle Dandy about George M. Cohan, Hollywood columnist Sidney Skolsky believed that a similar film could made about Al Jolson. Harry Cohn, the head of Columbia Pictures, agreed to the idea. Directed by Alfred E. Green (best known today for his masterpiece Baby Face), The Jolson Story is one of the most entertaining of the musical biopics of that era—an era that included Yankee Doodle Dandy, Till the Clouds Roll By, Words and Music, and Three Little Words. With Jolson providing almost all the vocals, and actor Larry Parks playing Jolson, The Jolson Story (1946) was one of the biggest hits of the year. Parks received an Academy Award nomination for Best Actor for his role in the film. The Jolson Story and its sequel Jolson Sings Again (1949) led to a whole new generation being enthralled by Jolson's voice and charisma. As a result, Jolson—who had been a popular guest star on radio since its earliest days—now had his own show, hosting the Kraft Music Hall from 1947-1949, with Oscar Levant as a sardonic piano-playing sidekick. Despite such singers as Frank Sinatra, Bing Crosby, and Perry Como being in their prime, Jolson was voted the "Most Popular Male Vocalist" in 1948 by a poll in the show biz newspaper Variety. The next year, Jolson was named "Personality of the Year" by the Variety Clubs of America. A life-long devotion to entertaining American servicemen (he first sang for servicemen of the Spanish-American War as a boy in Washington, D.C.) led Jolson, against the advice of his doctors, to entertain troops in Korea in 1950, even after his heart began to fail. At time of his death, he was staying at the St. Francis Hotel in San Francisco. While playing cards, Jolson collapsed and died of a massive heart attack on October 23, 1950. He was 64. Jolson was interred in the Hillside Memorial Park Cemetery in Culver City, California, where a statue of Jolson beckons visitors to his crypt. On the day he died, Broadway lowered its lights for ten minutes in Jolson's honor. 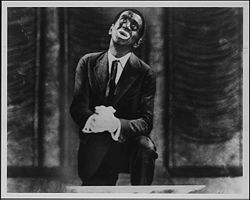 Jolson's legacy is considered by many to be severely neglected today because of his use of stage blackface. Jolson was not a racist, and blackface as a theatrical convention was used by many performers (both white and black). Some critics argue the make-up acted as a mask for Jolson, giving his performances a greater spontaneity. However, the make-up had roots in minstrelry shows where Jolson got his start, and is today viewed by many as racially offensive. Jolson was billed as "The World's Greatest Entertainer," which is how many of the greatest stars, including Bing Crosby, Frank Sinatra, Judy Garland, Elvis Presley, Mick Jagger, Jim Morrison, Rod Stewart, and Jackie Wilson referred to him. Charlie Chaplin wrote in his autobiography that Jolson was one of the most electrifying entertainers he had ever seen. Forty-four years after Jolson's death, the United States Postal Service acknowledged his contribution by issuing a postage stamp in his honor. The 29-cent stamp was unveiled by Erle Jolson Krasna, Jolson's fourth wife, at a ceremony in New York City's Lincoln Center on September 1, 1994. This stamp was one of a series honoring popular American singers, which included Bing Crosby, Nat King Cole, Ethel Merman, and Ethel Waters. Jolson has three stars on the Hollywood Walk of Fame: For his contributions to the motion picture industry, to the recording industry, and to the radio industry. 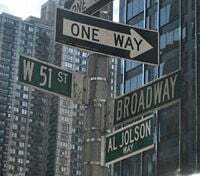 In August 2006, Al Jolson had a street in New York named in his honor after nine years of attempts by the international Al Jolson Society. Al Jolson at the Internet Movie Database. www.imdb.com. Collected works of Al Jolson at the Internet Archive. www.archive.org. The International Al Jolson Society. www.jolson.org. This page was last modified on 15 February 2019, at 22:53.